It looks whenever the UK government wants to appear tough on immigration, it would announce some half-hearted measures to make the immigration process a bit more unpleasant. The points-based system is a great improvement. But then came the hiking of visa fees, changing the time required for permanent residency from four to five years and retrospectively applying it (hence the protest and law suit from those came with highly skilled migrant visa), and the mandatory English test etc. which all looked good as a headline but won’t change much in practice. The points-based system was meant to attract the most qualified migrants, yet it seems those additional measures keeping popping up are purely there to make the application process a little bit more annoying, time-consuming and expensive. The new “migrant tax”, a £50 extra visa charge to non-EU migrants, is just one of them. The migrants have already paid whatever cost their application would incur directly. They have paid the visa fee. They bring spending money with them. In the case of international students, they will pay the full university tuition fee (ranging from £4,000 to £18,000 per year) as well. Once they are here, they will pay the living costs and pay tax if they work, and are not eligible to pub fund for some time in most cases. If this country takes them as part of the community, surely they should contribute, equally as the other members of the society, to the public services and infrastructures, through the tried and tested general taxation? People from outside the EU moving to the UK to work or study will have to pay £50 extra for visas to help areas struggling to cope with immigration. The £70m raised by the two-year scheme, announced by Communities Secretary Hazel Blears, will help fund more police support and translators. Many councils have warned of the strain that new arrivals have put on services. But critics say the cash will not have much effect and also warn that the move could stir anti-immigrant sentiments. Anthea Lipsett reports on the Guardian about the burden on the UK universities of the new points-based student visa system which will take effect on 1 April. “The whole visa application process is stressful, I must say,” says Yinko Akinoso, a Nigerian master’s student at Birmingham University. He had to apply for an extension to his student visa in January. It took until last week to get the biometric identity card now required of all overseas students. ID cards are one aspect of the new points-based immigration system that will come into effect for students from all over the world on 1 April. Universities have lobbied hard to make changes to help international students - and keep their institutions competitive in a tough recruitment market. But a lot of the detail as to how the system will work is still missing. 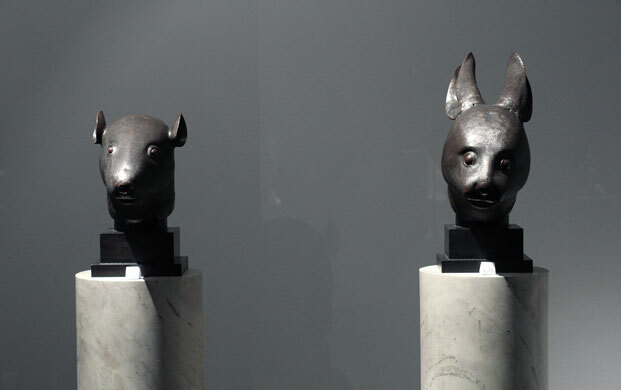 So the Chinese collector Cai Mingchao refused to pay the 28 million euro he bid for the two bronze heads at the Christie’s. Intentionally or not, this is an effective publicity stunt, forcing the story of disputed auctioning back to the news agenda. A point has been made again that no matter how legitimately Yves Saint Laurent and Pierre Berge acquired and owned the sculptures, the fact remains that they are war plunders, looted from China’s imperial palace. Incidently, the 8th Earl of Elgin, James Bruce, who ordered the destruction of Yuanmingyuan, the Old Summer Palace, where the bronze heads were looted from, is the son of 7th Earl of Elgin, Thomas Bruce, who removed the marbles from Acropolis and shipped them to Britain. The Greek government, like Chinese government, is asking for the return of the national treasures. David Reid, Tesco Chairman, in a 48 Group Club Young Icebreaker lecture to Scottish young people on Monday 2nd March, backs the Prime Minister’s statement made in January 2009 where Premier Gordon Brown wrote, “If we are to make the most of our relationship with China, we need to understand China better, through our schools, universities, cultural institutions, our businesses and in Government. I am determined to do that”.